Enjoy this 3-hour walking tour of Prague and let your guide take you to the Astronomical Clock in Prague's Old Town Square, Charles Bridge, Prague Castle, the Church of St. Nicholas and much more. 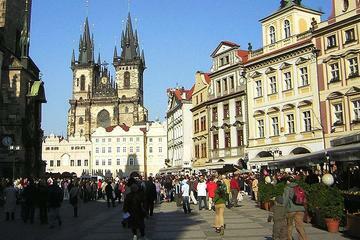 This historical walking tour of Prague sets out in the morning from the UNESCO-listed Old Town Square. Gaze at the medieval astronomical clock and stroll across the Charles Bridge with your informative guide. View other prominent landmarks such as the Church of St Nicholas and ride the tram to Pražský Hrad (Prague Castle) during your three hours of sightseeing.